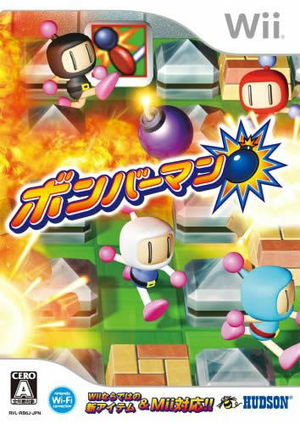 Bomberman Blast (Bomberman in Japan) is a brand new addition to the Bomberman series is available on WiiWare. Up to eight players can battle online simultaneously via Nintendo Wi-Fi Connection. Simple controls make this a great game for family and friends to enjoy anytime. You can trigger new items by shaking the Wii Remote controller, creating new levels of Bomberman excitement. You can even take the intensity up another notch by adding your own Mii caricatures to the mix. Battle results can be recorded on the Nintendo Wi-Fi Connection Ranking, so you can see how you stack up against others around the globe. This title will prove to be a blast for everyone--from those who've never touched a Bomberman game to the Bomberman masters. Bomberman Blast (Wii) is capable of using both GameCube controllers and Wii Remotes. If a physical controller is set to emulate both a GameCube Controller and a Wii Remote concurrently, it will operate both devices at the same time. To fix, migrate controls to use separate physical controllers. The graph below charts the compatibility with Bomberman Blast since Dolphin's 2.0 release, listing revisions only where a compatibility change occurred.